Sequins and beads on fabric, with clear plastic "window" covering paper chromolithograph of St. Jacques' face (30 1/2” x 32”), c.2000. This flag is published in Spirits in Sequins: Vodou Flags of Haiti (p. 66). This flag is being sold by Judy Hoffman for the benefit of the Art Creation Foundation for Children, which she founded in Jacmel, Haiti. Edgar's Studio, Bel-Air, Port-au-Prince, 1995 (Photograph © Anthony Hart Fisher 1995). 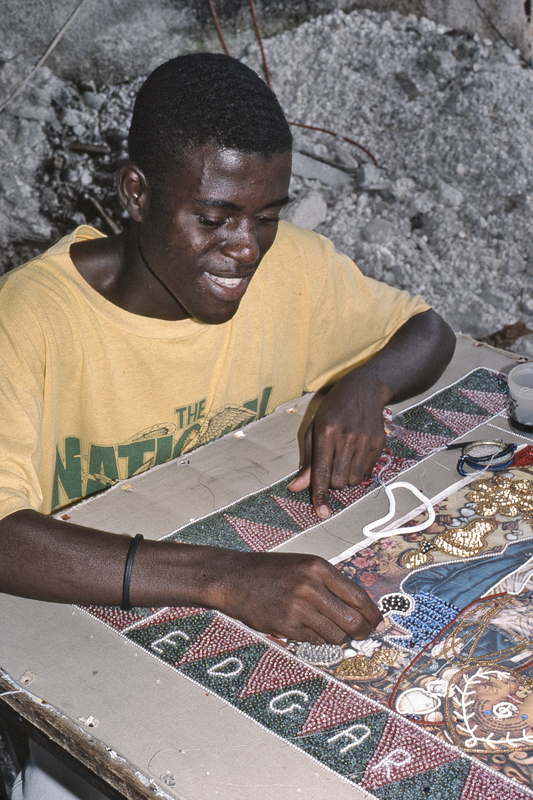 Edgar Jean Louis was one of the leading houngans and vodou flag makers in the Bel Air neighborhood of Port-au-Prince. He was born in 1921, and shared a temple with the fellow artist and houngan, Sylva Joseph. His work was characteristic of the classic Bel Air style of design and craftsmanship.